Magic Eyes: colored lenses without correction available in 5 colors for a day or for 3 months to enhance your eyes! 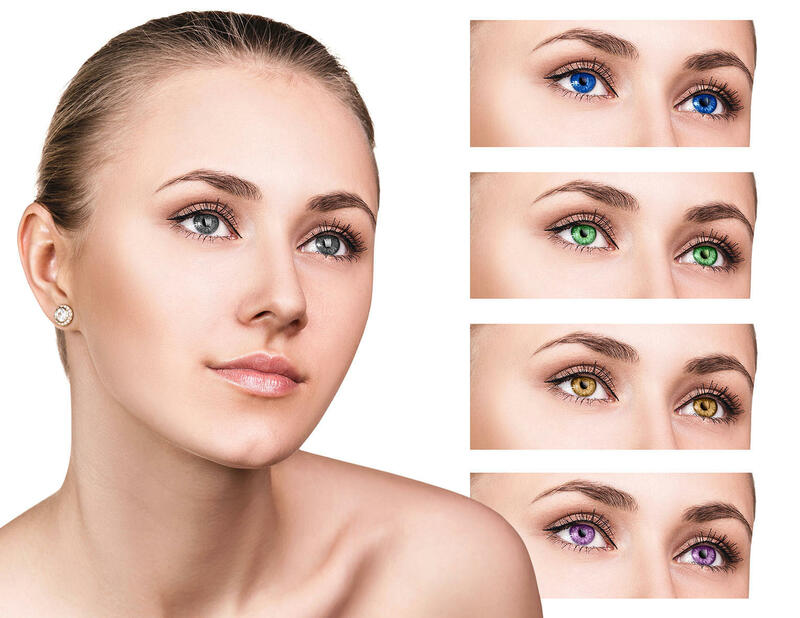 Blue, Green, Purple, Amber or Grey colored lenses: Magic Eyes contact lenses enhance the beauty of your eyes. Your eyes are magical, you are charming, seductive! Magic Eyes colored lenses without correction for fun, seduction and self-esteem! 2 types of lenses: the UNO daily or monthly (for 3 months). 5 different colors: Blue, Green, Purple, Amber and Grey. • Your eyes shine bright ! A perfect iris, delicate and well-limited outlines to get seductive and natural bright eyes. All Magic Eyes lenses, either Blue, Green, Purple, Amber or Grey, have a Black corolla, like your own iris. You can change the color of the eyes and keep it beautiful and natural. • A soft material: it is easy to put them on! Monthly Magic Eyes lenses are very easy to place on the cornea. Lenses are made of silicone hydrogel, an ultra-flexible polymer. The colored lenses perfectly fit the surface of the cornea. UNO Magic EYES: are you looking for a change, be seductive for a day or for a night out? UNO Magic Eyes are made for you! Your Magic Eyes lenses come with an instruction manual explaining how to put them on. Monthly Magic Eyes: are you looking for a change for a few days, a few weeks or even a few months? Monthy Magic Eyes are made for you! Monthly Magic eyes lenses come in a kit including your lenses, the solution to take care of them and a protective case. And if you need additional solution for your colored lenses, we have just what you need: VITALENS multifunction solution. Magic Eyes colored lenses without correction: to amaze, seduce and enhance your eyes, whether for a night out, a few days or even a few months. Magic Eyes colored lenses are without correction. They do not correct any visual trouble so it means you can wear them even if you wear correcting glasses. You want to amaze your friends or seduce for a night out, a date, a day or longer? Magic Eyes colored lenses are made for you! Because the color of your eyes is part of the magic, Magic Eyes offers 5 colors you can choose from to enhance the expression of your eyes. Monthly Magic Eyes: you can choose from 5 colors that will enhance your eyes in a wonderful way! Nothing is as charming and beautiful as bright eyes to catch the attention! Your eyes speak out! Either Turquoise eyes with dark skin, Green eyes with white skin or Amber eyes with mixed skin, it is up to you! Magic Eyes colored lenses will suit everybody whatever the color of your skin. UNO Magic Eyes for one day or monthly Magic Eyes for a longer use. Both ranges offer a choice of 5 colors. UNO Magic Eyes: perfect for a single use. 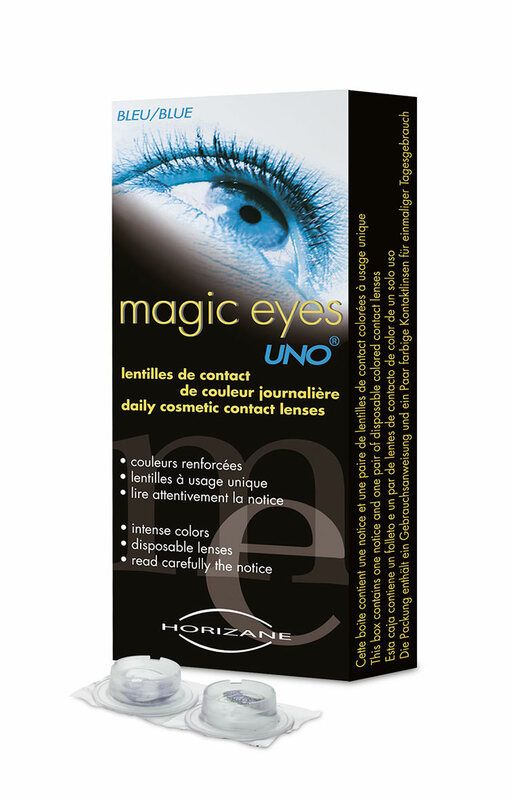 UNO Magic Eyes is a single use daily contact lens. Do you plan to celebrate a special event, a night out, a birthday party or a date? All the occasions are welcome to choose one of the 5 Magic Eyes colored contact lenses! Monthly Magic Eyes: perfect for a longer use. Do you want to keep the magic in your eyes longer to seduce, amaze or simply look beautiful? Monthly Magic Eyes lenses are made just for you! Monthly Magic Eyes lenses are available in a kit including the solution, the case and the instruction manual to learn how to put them on and take good care of them. You will be able to wear them whenever you want over a period of 3 months. When not using them, they will be safe in the case provided in the kit. They will be soaked in the solution, keeping them safe for 3 months. It is important to know that you will be able to wear your Monthly Magic Eyes lenses during 3 months, starting the day you first use them (the day you open the box). 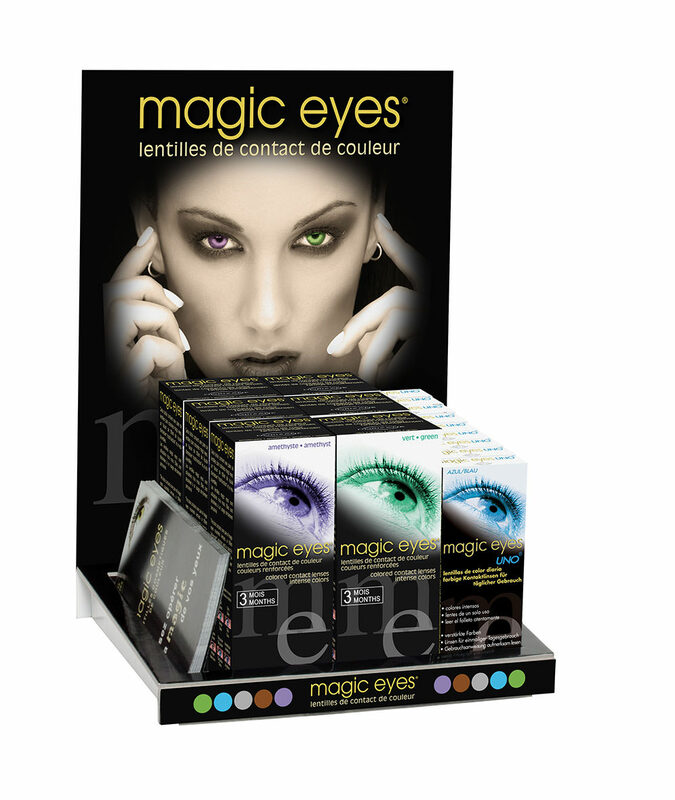 Magic Eyes: colored contact lenses to be handled with care to preserve their quality and their sterility. Colored contact lenses, so as any other contact lenses, are hydrogel silicone polymer-made membrane. The essential quality of the hydrogel silicone polymer is its excellent transmission of oxygen to the cornea. Colored contact lenses offer the same technology as the best soft lenses on the market. Molecules of hydrogel silicone polymer contain very soft pigments of color and they perfectly and gently fit the surface of your eyes. This softness is absolutely mandatory to perfectly cover the surface of the eyes and give optimum comfort. It is important to point out that hydrogel silicone is in perfect chemical harmony in the solution. Nevertheless, it is badly and quickly affected if stored outside the solution. This is why it is important to keep your Monthly Magic Eyes lenses well hydrated with the solution provided in the kit. Should you need more solution, you can get all the multifunction solutions for soft contact lenses you find in pharmacies. They will all suit your Magic Eyes lenses such as VITALENS solution provided by HORIZANE. To put the colored Magic Eyes lenses on is easy. The instruction manual will clearly explain the different steps you need to follow. A simple mirror will be sufficient enough to adjust the lenses on your eyes. Blink your eyes a few times for the lenses to adjust. Magic Eyes is a pharmaceutical quality product: it is sterile. Colored Magic Eyes lenses are manufactured and packed in 100% sterile units. 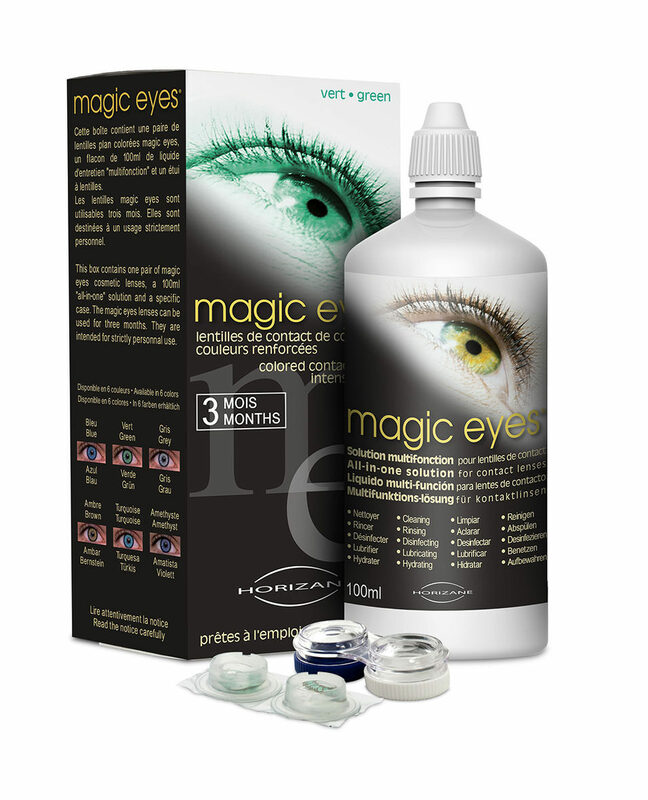 Magic Eyes is only available in pharmacies to safely guarantee its sterility. The lenses are soaked in the solution that cleans and keeps them safe. The solution is sterile so it is essential to change the solution after each use. Handle the lenses with care and wash your hands with soapy water before taking them with your fingers.